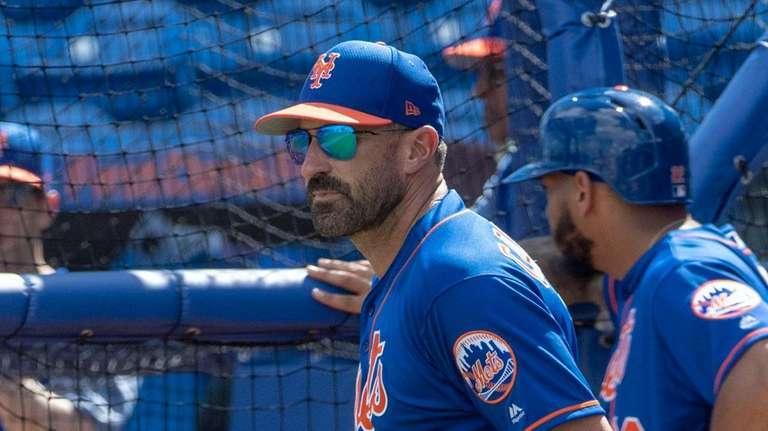 Mickey Callaway is looking for someone who can throw strikes and eat up innings when needed. PORT ST. LUCIE, Fla. — For the Mets, it is perhaps the least significant roster decision they’ll make this spring, a real "how much does this even matter?" sort of situation when you consider what will make or break their season. For those in contention for the Mets’ last bullpen spot, though, it’s a potentially career-changing shot at the majors. With less than a week to go in spring training, that job remains winnable for all of the half-dozen relievers competing for it. The Mets are expected to carry seven relievers to open the season and entered spring training with five guaranteed jobs: Edwin Diaz, Jeurys Familia, Seth Lugo, Justin Wilson and Robert Gsellman. It seems safe to pencil in non-roster invitee Luis Avilan to one of the two other spots. Avilan has 13 strikeouts, no walks and a 2.38 ERA in nine games, and Callaway regularly has praised him heavily. Peterson didn’t allow a run in his first seven games, which seemed to give him the inside track, but has been knocked around for five runs in his past two outings (2 2/3 innings). Santiago was going good until the Nationals scored six runs in two-thirds of an inning against him Sunday. Callaway said the Mets value strike-throwing in this competition, which, based on exhibition games, would seem to favor righty Peterson and lefties Santiago and O’Rourke. “When you’re talking about the last couple guys in the bullpen, you got to throw the ball over the plate,” Callaway said. “Because more than likely, the situations you’re going to pitch in are not ideal, and the last thing that you want is someone that goes out there and can’t get through an inning. That touches on another factor: Do the Mets want to carry a long reliever? If so, the Mets have Santiago, a former starter who mostly pitched out of the bullpen for the White Sox in 2018, and Dowdy, a starter by trade and Rule 5 pick who has to be offered back to Cleveland if he doesn’t make the Mets. A desire to have a long man could be a lifeline for Dowdy, who tossed three scoreless innings Monday against the Nationals. But given that their starters should regularly pitch deep into games, the Mets are comfortable not carrying a traditional long reliever/swingman in favor of short relievers who can handle multiple innings. That’s one reason they’ve had O’Rourke, Peterson and Bashlor each go more than an inning in recent days. If the Mets picked a winner based on numbers alone, O’Rourke — in camp on a minor-league contract — would have a good shot. Notably, he can be optioned to the minors, offering roster flexibility that the Mets value for when they want to call up a fresh arm (underscoring the reality that the team will likely cycle through a bunch of relievers in this No. 7 spot, whoever makes the Opening Day roster). O’Rourke, 30, spent almost all of 2017-18 rehabbing after Tommy John surgery, but in 2016 had a 3.96 ERA in 26 games for the Twins. This spring, O’Rourke has felt close to his pre-injury form, proving to himself that he belongs. Notes & quotes: The Mets’ game against the Marlins was rained out Tuesday. Zack Wheeler, the scheduled starter, will face minor leaguers Wednesday, stretching out to about seven innings . . . The Mets used their sudden free time Tuesday for a “classroom session” with position players, Callaway said, covering cutoffs, relays and “about 30 different subjects for the season. Going over all the things we might encounter. It was actually a productive day considering we got rained out.” . . . J.D. Davis had his wisdom teeth removed Monday. The Mets expect him to be able to play Thursday.